Why Ship to South Africa? What can I send to South Africa? What items are restricted? Whether you’re staying in one of South Africa’s buzzing cosmopolitan cities, such as Johannesburg or Cape Town, taking a break on the coast, going on safari, or packing all of the above into one holiday, you will have plenty of things that you need to take with you. Your suitcases will likely be packed to breaking point with clothes and sports equipment, and that’s not even to mention all the souvenirs you’ll want to bring home. Send My Bag offers a simple and reliable service to get your bags from point A to point B quickly, at an affordable price. Airlines are charging huge excess baggage fees nowadays if your bag is only a kilo or two overweight, and these charges are putting people off travelling where they want to go for as long as they want to. But we can get your bags from your home to your destination, even if it’s in the middle of a safari game reserve on the Garden Route, or just in Cape Town, for a smaller price and at your convenience. Perhaps you are going to South Africa to study – in which case Send My Bag can be an enormous help, by shipping everything you need to your student accommodation to allow you to get stuck into your studies with all your home comforts around you. You can send your luggage to South Africa, in suitcases or boxes. You can do this with Send My Bag – a luggage courier service that picks up your items from your home or workplace and delivers them to your destination in South Africa on a speedy, affordable service. This takes the stress and physical effort out of travelling, as you won’t have to drag your luggage behind you. To read more about sending luggage to South Africa, take a look at our ‘How it works’ page, or our ‘FAQs’. South Africa has plenty of golf clubs to choose from; hundreds in fact. But experts rate the following courses as some of the best in South Africa: Fancourt, Durban, Gary Player and Leopard Creek. If you would like to try out one of these excellent courses, or any others in South Africa, you can use your very own golf clubs if you send them to South Africa with Send My Bag. We will pick them up from your home or office and deliver them to your accommodation in South Africa, then pick them up again when you are heading home. See further information on how to send golf clubs with Send My Bag, including how best to package your golf clubs. South Africa’s diverse terrain means there is plenty for the keen cyclist to enjoy. You can pedal through vineyards, along coastline, and through mountain passes. Don’t worry about having to rent a bike, though, as you can just send your own bike to South Africa with Send My Bag. As long as your bike is packaged securely, Send My Bag can send it to wherever you are staying in South Africa, and send it back home again when your holiday is over. Sending your bike to South Africa is a better option than checking it into the hold of your plane. You will avoid oversized baggage fees and won't have to carry the bike to and from the airport. Your bike will need to be taken apart and properly packaged before being sent to South Africa. Check out our information on bike shipping to learn more. International removals to South Africa is probably something you have considered if you are relocating to South Africa permanently. If you decide to use a removal company, make sure you have researched them well before you hand over your precious possessions and always use suitable packaging for your items, and tape everything up well. South Africa boasts many world-class universities, such as the University of Cape Town, the University of the Witwatersrand and Stellenbosch University. If you are an international student moving to South Africa to study or do research, Send My Bag could be a lifesaver, as it allows you to bring lots of home comforts, study materials and daily essentials with you to South Africa, so that you can turn your student room into a home from home. Send My Bag can ship your possessions for you and take the hassle out of your move. Read more about student shipping on our student removals page and find out how to receive your student discount. Send My Bag can ship parcels to South Africa for you and for your friends or family members, allowing them to send you things while you are abroad, such as an item you may have left behind at home. It couldn’t be easier to send a parcel to South Africa with Send My Bag. Choose a sturdy box, pack up your items safely and tape the box up well so nothing gets damaged in transit. Find out more about sending a parcel and learn what you can send with Send My Bag and how to package your items. If you need to send more than parcels, baggage and luggage to South Africa, you could look into the following options for shipping items internationally, especially if you need to send large, bulky items like a sofa or dining table. You may have considered using air freight to send some big items to South Africa. This is quite a fast service, requiring only one to two days to fly your items to their destination. This comes at a cost, however, with the service potentially being rather expensive. In addition to the cost of the service itself, you will probably also have to pay a customs agent to handle customs clearance for you. An additional expense to consider is getting your items to and from the airport. If you send internationally by air freight to South Africa your items will likely arrive at one of the international airports, such as Johannesburg, Cape Town or Durban. Sea freight or container shipping is another option for getting your possessions to South Africa. Unlike air freight, sea freight requires several weeks to get your items to the port closest to your destination. It is normally less expensive than air freight but you will still need to pay for the services of a customs agent and will need to arrange how to get your items to and from the ports. If you choose container shipping to South Africa, your items will most likely arrive by ship at the Port of Durban, the Port of Cape Town or Port Elizabeth. As standard, there is a 3-day customs clearance delay for personal effects. Send My Bag will require a copy of the customer's passport, flight ticket into South Africa along with their entry stamp. An exit stamp and ZA ID number will also be required for returning South African residents for duty free entry. Clothes sent to charities will be treated as commercial with duty and taxes applicable. As most countries give travellers a free personal effects allowance, the majority of shipments sent with Send My Bag are not stopped by customs when they arrive in their destination country. Personal effects are normally viewed as used items that the sender has owned for at least 6 months. You can expect to pay taxes and duties if brand new or commercial items are found in your shipment by South African customs officials. This is something to bear in mind if you wish to send gifts in your shipment. Please research what duties you need to pay and which documentation to include when sending gifts to South Africa. You must demonstrate that you are shipping personal effects by writing a short packing list, set out as follows: "6 x Denim Jeans x 1 x Leather Jacket, 3 x Cotton T-shirt", etc., rather than as "10 x Used Clothing". When a bag is stopped by customs for any reason (missing documentation, prohibited contents, commercial contents or further information required) Send My Bag™ records how long customs hold it for. Our historical statistics for this route indicate that if the customs authority stops your bag they will on average take 6 days to process it and release it back to us for delivery. Customs processes and allowances are different depending on the country, so all travellers are advised to take a few minutes to find out how their circumstances and the nature of their shipment will be assessed under South African customs regulations. More information can be found on our customs information page. South Africa allows nationals a maximum of 2 ‘gift’ shipments per calendar year, provided the value does not exceed R500. A gift is classified as any item sent from a natural person abroad, to another natural person living in the Republic of South Africa (shipments cannot be sent from or to a business address) and is unsolicited. These include, but are not limited to, Birthdays, Weddings & Anniversarys etc. South Africa does not allow a consignment containing multiple gifts for different people to have the duty relief split across different people. Therefore, if the declared value exceeds R500 any applicable duty/tax will be applied to the entire shipment. South Africa has a total of eleven official languages, of which two are European in origin: English, which is used in public and commercial life but only the fourth most spoken first language, and Afrikaans, which originates from Dutch. This is in addition to nine Bantu languages from ethnic groups of black African ancestry. The currency used is the South African Rand. The climate in South Africa is generally subtropical and the region is famed for its long hours of sun and dry days with little rainfall. The interior of the country is on a high plateau, which keeps it cooler than other areas on the same latitude, with summer temperatures staying generally below 30°C. South Africa is a holiday destination to suit all tastes, with active adventure breaks, city breaks and beach holidays to be enjoyed. You simply can’t visit the country without taking a safari and attempting to spot the “Big Five”: lion, elephant, buffalo, leopard and rhinoceros. The Garden Route is the most popular place for safari and is home to several reserves, such as Kariega Game Reserve, where you can stay in a fabulous lodge and go out early in the morning and later in the evening to spot game, but spend your days relaxing around the resort. 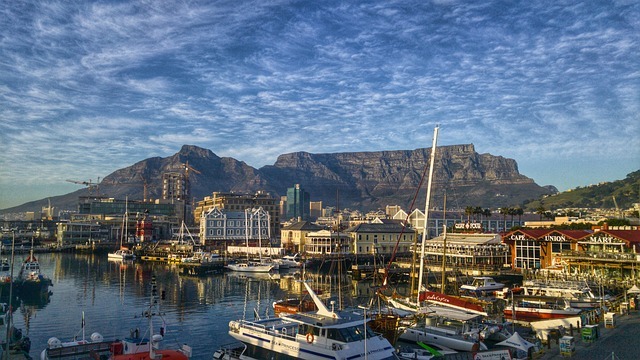 Cape Town is a hugely popular destination for its modern lifestyle but traditional outlook. It is packed with markets and boutiques, but also offers paragliding off the Lion’s Head and abseiling from Table Mountain. South Africa is brimming with exciting activities for everyone to participate in, from river cruising and kayaking with crocodiles and hippos in St Lucia, to micro lighting and canopy tours in Durban, and even ostrich riding.